Longview ISD students have shown improvements on state standardized tests this spring, according to preliminary test results from the Texas Education Agency. Longview ISD students have shown improvements on state standardized tests this spring, according to preliminary results from the Texas Education Agency. But more improvement is needed. 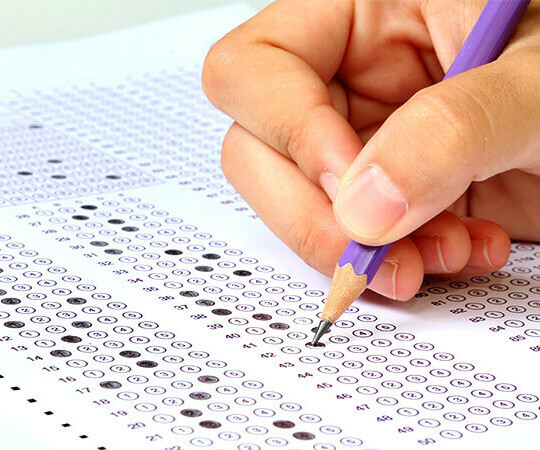 District staff is still studying the initial STAAR test data it has received from the state and Latitia Wilson, Longview ISD Director of Assessment, Research, and Accountability, said the results are varied across the different grade levels for the tested subject areas. "We've improved in some areas, stayed the same in some areas, and gone down in some areas," she said. "We're always glad to see improvements, but will continue to work toward improving scores across the board." STAAR scores will be finalized over the course of this summer, with district accountability ratings being released in August. "It's important to remember these are just preliminary scores and very likely to change as we continue to get data from the state," Wilson added. LISD campuses that posted gains at the Approaches (passing) level in third-grade reading were Bramlette (3%), Johnston-McQueen (6%), and Ware (15%). Hudson PEP’s Approaches level remained at 100%. Most schools posted gains in fourth-grade reading. The biggest gains in fourth grade reading scores were at Bramlette (19%) and Ware (17%). While Ware Elementary School and Forest Park Middle School had gains in all tested grades in reading, Everhart’s reading scores declined in all tested grades. Approaches levels for LISD were 74% in third-grade reading, 74% in fourth-grade reading, 86% in fifth-grade reading, 65% in sixth grade reading, 72% in seventh-grade reading, and 79% in eighth-grade reading. Scores at the Meets and Masters levels were up at most campuses in grades 4 and 7. Wilson said she was impressed with how the district's Myon digital reading system has already impacted reading scores on campuses such as Bramlette and Ware. "These campuses have continuously earned the highest reading minutes in the district and have shown improvements in their preliminary scores," she said. "Our principals have worked hard throughout the district and that will continue to show in the data." 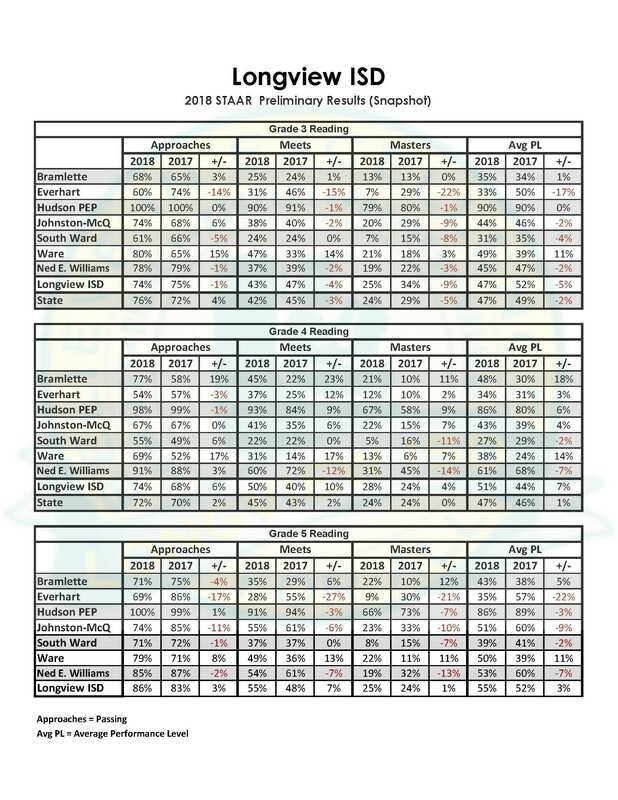 Math results for the elementary schools were similar for the tested levels, with third grade showing lower results than last year’s scores and falling one to two percentage points in comparison to state levels. Most elementary schools showed gains in fourth grade math at the Approaches, Meets, and Masters levels, and all of the middle schools saw gains at all three levels in sixth grade. 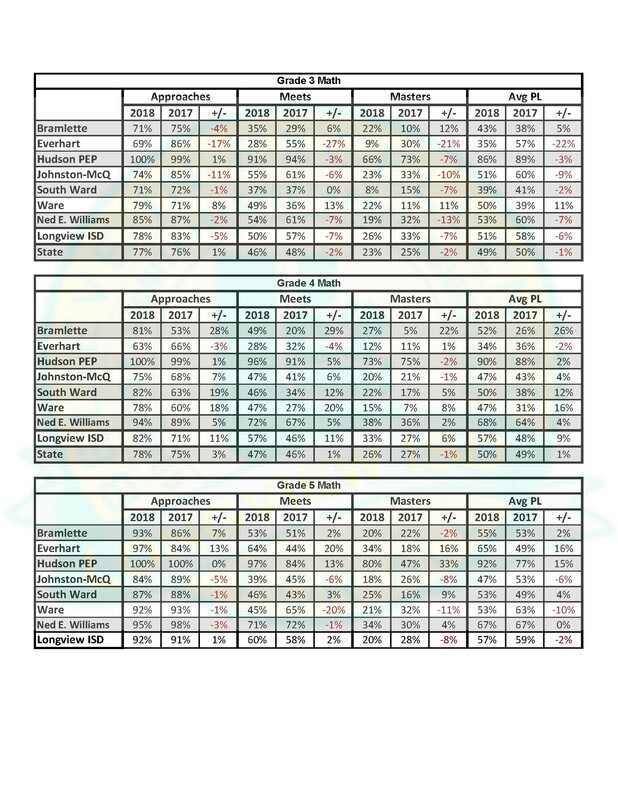 At the Approaches level, Bramlette had an increase of 28%, South Ward had an increase of 19%, and Ware had an increase of 18%. Most of the other elementary campuses had smaller increases. Although fifth-grade math scores at the Approaches level dropped slightly at most of the campuses, the district had a 1% gain in fifth-grade math. Approaches levels in math for LISD were 78% in third grade, 82% in fourth grade, 92% in fifth grade, 79% in sixth grade, 75% in seventh grade, and 93% in eighth grade. All three middle schools had 100% of their students at the Approaches level in Algebra I. Fourth grade writing results showed significant gains at the Approaches level for Bramlette and Everhart at 38% and 14%, respectively. Ware and Johnston-McQueen showed losses at the Approaches level, but showed increases at the Meets level. Seventh grade writing results were down by a few percentage points at Forest Park and Foster. South Ward Elementary School and Judson Middle School participated in the Writing Pilot and did not have scores this year for comparison. Longview ISD scored above the state average in writing for grade 4 (70%), but below the state average for grade 7 (61%). Science scores dropped at the elementary and middle school levels this year except at Everhart, South Ward, and Ned E. Williams. 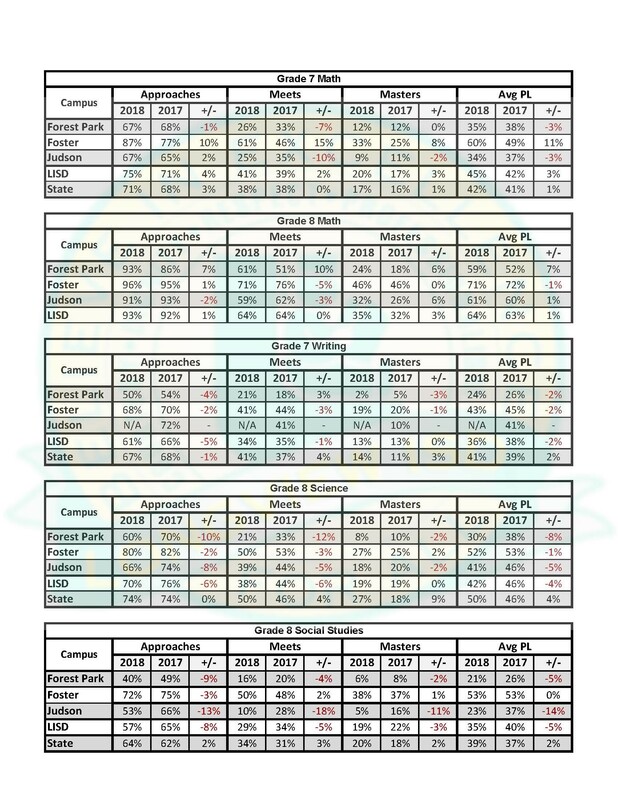 LISD dropped from 76% in 2017 to 75% in 2018 in 5th grade and 76% in 2017 to 70% in 2018 in 8th grade. Social studies scores saw drops from 3% to 13% at the middle schools. 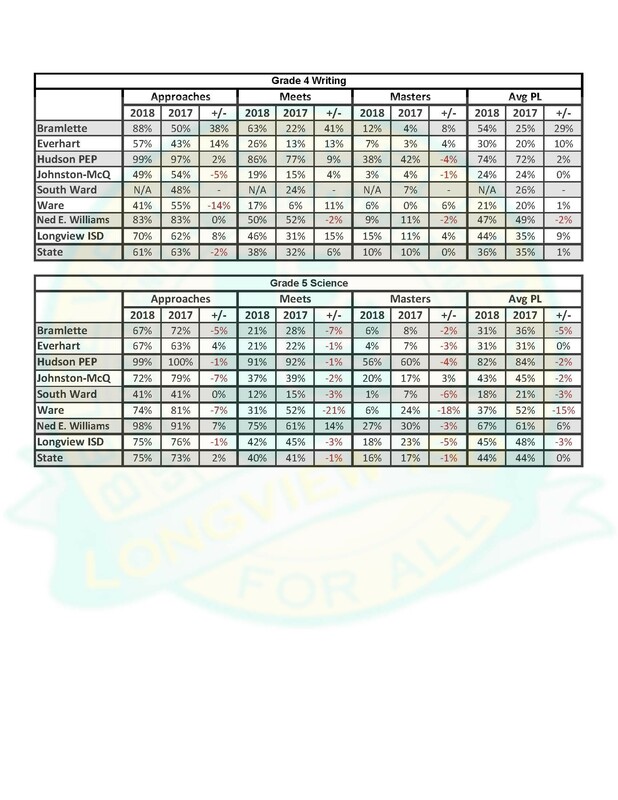 Longview ISD dropped 8 points from 65% to 57% in 2018. Longview High showed gains in Algebra I (5%) with a 92% passing rate, English I (5%) with a 71% passing rate, and Biology (2%) with a 93% passing rate. The high school's U.S. History passing rate remained the same at 95%, but the Meets and Masters levels for U.S. History did increase 4% and 9%, respectively. English II scores dropped from 74% in 2017 to 68%. Early Graduation High School showed a 6% gain in English I, stayed the same in Algebra I, and dropped in English II (3%), Biology (4%), and U.S. History (9%). "It goes without saying that we are not where we would like to be," Wilson said. "At the same time, we're continuing to see progress in various areas. So we're optimistic about where we can go from here." "We will continue to provide teachers with meaningful professional development in order to close the performance gaps of students at all campuses," she added. To download the complete preliminary report, please click here.